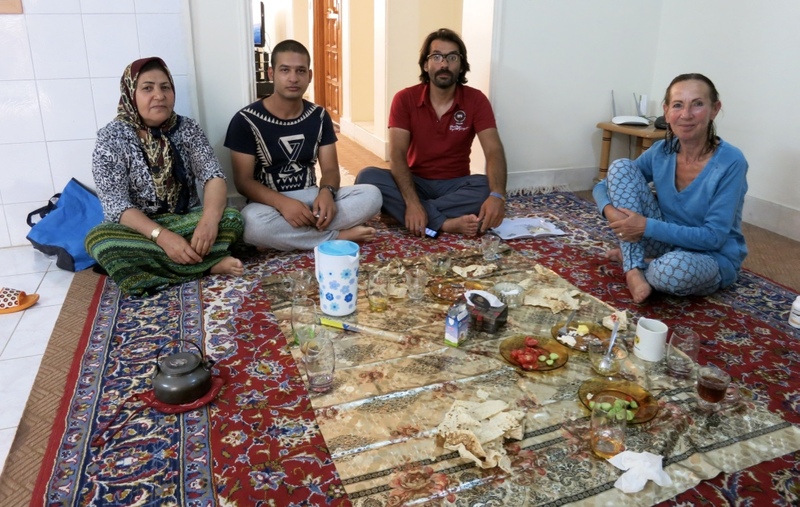 Two days after reaching the Caspian sea we arrived in Bahram's garden cottage. He's a Warmshowers host in the seaside town of Bander Anzali. A very nice and busy guy. For insiders, a bit of a Gomba type :-). We spent two days in his cottage. He took us to a very sympathetic and well organised private orphanage that he supports, where we had a wonderful meal and where he hosted another cyclist, Cyrille from Grenoble. And he arranged tickets for a VIP-bus from Rasht to Shiraz for us and for which he involved another WS-host, Pedram, who bought our tickets for us and delivered them to us at the terminal. 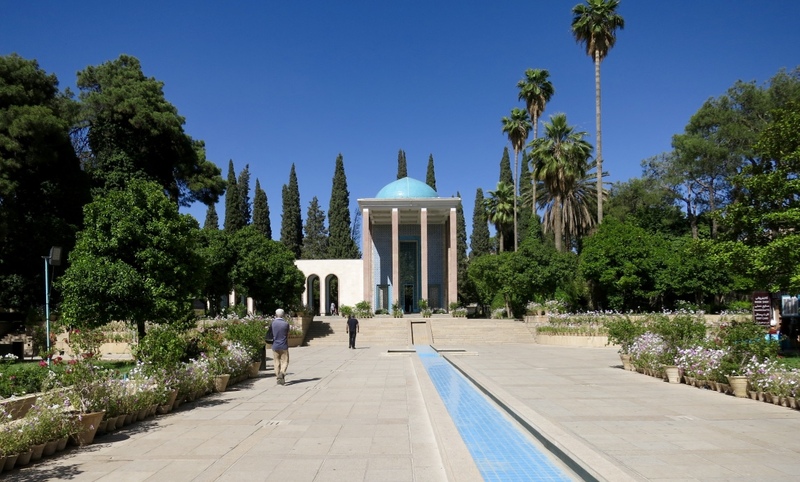 We deciced not to cycle southward to Shiraz, our final southernmost destination, and then take a bus back to Tehran. Because of climate-reasons we considered it wiser to do it the other way round. 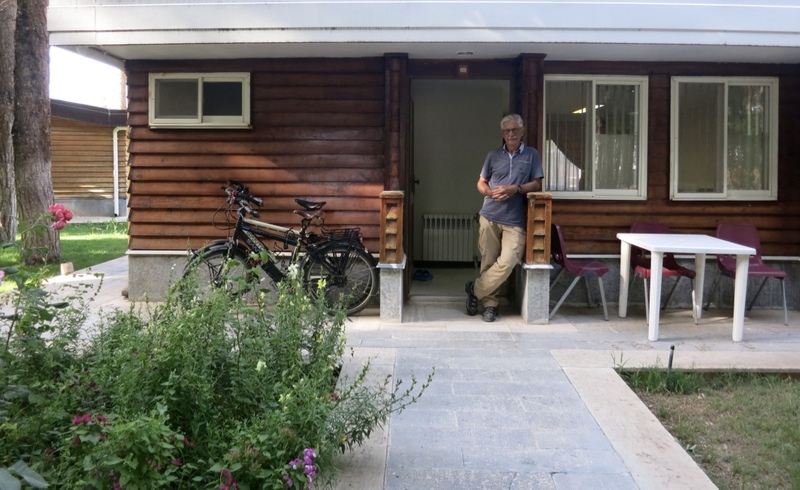 So, after 50 km ride to Rasht and a surprisingly comfortable 17-hour and 1200 km bus journey (only 25 businessclass seats on board) with a good sleep we arrived in Shiraz at 06.00 the next morning. 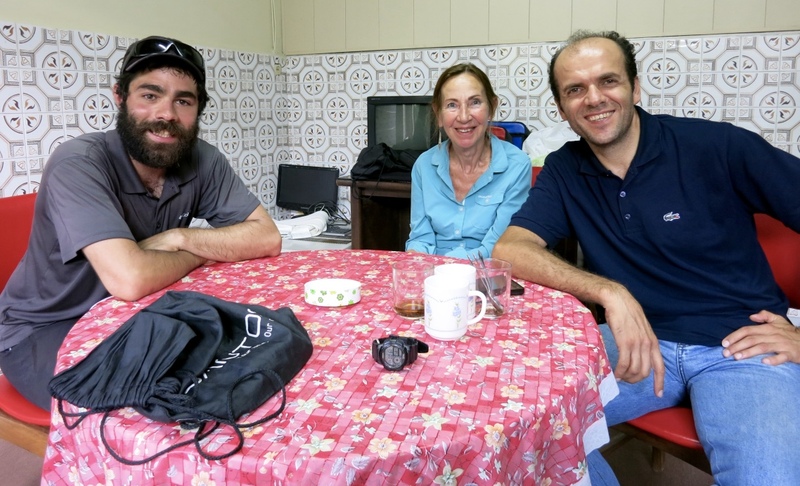 And yes indeed, Reza, our new WS-host came to meet us there (another service by Bahram). First thing we did was repair a flat tire, which had miraculously occured a puncture in the bus's cargo hold. Then another 20 km ride to Reza's house (Shiraz is a wide spread city) where we were welcomed by his brother and mother. We lived there for two days on the carpetted floor and were very well taken care of. 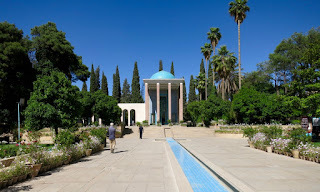 Shiraz has some beautiful sites, though the world famous gardens didn't impress us as much as we had expected. Furthermore Shiraz is surrounded by very dry mountains and already very hot in these last spring weeks. Next destination was Persepolis, the capital of the antique Persian empire, built in the sixth century BC by king Darius and destroyed by Alexander the Great nearly 200 years later. 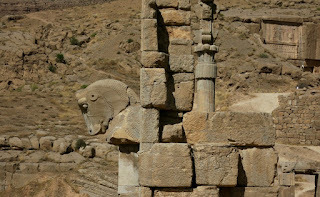 An impressive archeological site and a beautiful bungalow hotel for us nearby.